Today’s guest post is by Shirley Hershey Showalter (@shirleyhs), author of the memoir, Blush, to be released in September 2013. That’s the way many writers view the small press: something you swallow your pride to accept and then make the best of. For some of us, however, small presses actually serve as our first, or even best, option. Here are three case studies that show why. Richard Gilbert worked as a book publicist at Indiana University Press, and then as a publicist and marketing manager at Ohio University Press/Swallow Press, so he has an appreciation for the advantages of small presses. 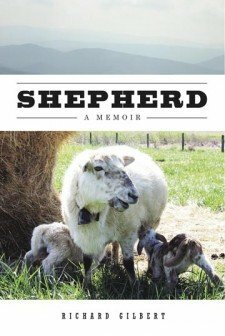 His memoir, Shepherd, releases in May 2014. Was a university press your first choice? Why or why not? During the seven years of working on Shepherd, I pitched trade presses and agents. I ended up getting rejected in all categories, including university presses, but accepted by two university presses—making for a hard choice—and had close passes from some trade publishers and agents. Unfortunately, I blew my best chances with two or three small trade presses fairly early in the process when my book wasn’t ready, but I couldn’t see that. There are so many manuscripts clamoring for attention, it’s basically one strike and you’re out, anywhere. If you just think your book is ready, it isn’t—you have to know it’s ready. Beyond that, it’s harder to get an agent than to get a publisher; they are in business, a hard one, to find and to sell books to publishers on the promise that every man, woman, and child in America will want to read it. I exaggerate, but not by much. What benefits do you see in publishing with a small press? University presses usually have excellent copy editors, high production values, and tend to keep their books in print a long time. The latter benefit is a real biggie for me, since a big trade house may give a book a year and then it’s gone. Like any publisher, university presses are looking for books that “fit their list,” which means their subject categories and often their geographical region. It astounds me how many writers give up rather than try a university press. I knew a writer who had a great 9/11 story to tell, wrote a great proposal, and had it rejected in New York and gave up. “Why didn’t you try a university press, maybe Rutgers?” I asked. “Because,” she said, “I want to make my living as a writer.” I think my mouth fell open. My saying all this makes university presses seem like pushovers and they’re not. For one thing, they are under tremendous financial stress as universities support them less and as the bookselling landscape changes so rapidly. But they’re still publishing books and looking for books. What do you enjoy specifically about the press you are working with? I appreciate the way the folks at Michigan State are a team. And I love my book’s cover and the way they involved me when they deadlocked between it and another cover; I got to break the tie. The editor who acquired my book, Julie Loehr, responded to my proposal, read the manuscript and liked it, and then sent it to three outside readers. Such readers are a difference at university presses, stemming from their practice of publishing scholarly books. I loved who Julie picked. One person was supportive but taciturn, while the other two said all kinds of ecstatic things and identified one shared concern. The epilogue was tripping them up, and though they couldn’t say why, I knew that a technique I had tried wasn’t working. Julie was really low key. She said, “Do you want to take a look at it? It’s your book.” I did, and am grateful for that process. Any downside? What kinds of books and authors do not fit university presses? University presses don’t have big advertising budgets. One of the reasons they like and look for niche books is because they can find and market to niches. They have been credited with keeping short stories alive, not to mention providing crucial life support for poetry. It takes a ton of money to market bestsellers, but thankfully that’s not the only book market. A trade publisher might turn away from a book that’s not going to sell tens of thousands copies, whereas a university press may publish one that has prospects of selling 3,000 or fewer. A rule of thumb is that you need an agent for trade houses, whereas generally speaking university presses don’t like dealing with agents. They will do it, and an agent can help improve your contract—university presses’ boilerplate contracts can be too one-sided, excessively favoring the publisher—but university presses are used to working directly with authors. I joined the Authors Guild for help with my contract, and I recommend the organization. In July 2013, during a special promotion, Eleanor Vincent’s memoir Swimming with Maya became an Amazon bestseller, edging out Sheryl Sandberg and Tina Fey. Did you consider the Big Five? Did you try them before deciding on a small publisher? I went through the traditional publishing process initially. My former agent, Laurie Harper, sold my book on the basis of a proposal and sample chapters. We tried all of the Big 5, and I have a file full of beautiful rejections—editors loved the writing but sales and marketing could not see a market. Ultimately, Swimming with Maya was published in 2004 by Capital Books, an imprint of International Publishers Marketing. IPM provides distribution and marketing services for a number of smaller presses. It was a beautiful hardcover book priced at $28. Despite garnering favorable reviews and quite a lot of publicity (I was interviewed on CNN and several local TV shows, and featured in many articles), Swimming with Maya sold tepidly and slowly. In all, I think we sold about 2,000 books before Capital closed its doors in 2010. They kept the book on their backlist, but did no active promotion after the first half of 2004. Because it never went into paperback, it was not available to book clubs. I see that as a huge factor in the trajectory I am describing. Book clubs are the ideal forum for Swimming, which I discovered as I began speaking to the few that would read a hardback and invite the author for tea! When I heard that Capital was closing and would be pulping the remaining copies, I looked into self-publishing. Laurie Harper was no longer my agent, but she advised me to consider a print-on-demand version of the book. I also talked with the Authors Guild about their “Back in Print” program, which provides a way for authors to keep their books available on a print-on-demand basis, but with very limited formatting. I balked when I realized that I could not keep the book’s beautiful cover using their program, and that if I went with AG, that would limit my options going forward. Meanwhile, the whole publishing landscape had changed. Social media was becoming the way to build an author platform and lots of new options for publishing, including very small companies like Dream of Things were springing up. As luck would have it, a friend, Madeline Sharples, had a memoir out, Leaving the Hall Light On, which was suddenly dropped when her very small publisher also closed. She found Mike O’Mary, publisher at Dream of Things, and he brought out a paperback and e-book version of her book. Madeline offered to e-introduce me to Mike. He read Swimming and loved it, and agreed to reissue it in formats that are much less expensive to produce and sell than a hardcover edition. Frankly, self-publishing never appealed to me. I am a writer with a corporate day job. Any time or energy I have must go into my writing. I lack the skills and interest to deal with gnarly things like technology glitches and distribution. What I instantly loved and recognized in Mike was someone who was passionate about books and my genre—narrative nonfiction, including memoir and personal essays. That’s what I love, read, and write. I read some of Mike’s essays and found a kindred spirit who happened to have the skills and interests in the mechanics of publishing that I lacked. I observed what he was doing to promote Madeline’s book and knew he would do a great job with mine. I wanted someone to help spearhead the marketing effort as well. Mike has been terrific in that department. He’s found the right virtual venues for promotion, and the latest BookBub promotion shows how well his approach works. In one weekend, we’ve sold more e-books than Capital sold in hardcover over 6 years! And this is not to mention the 12,000 downloads that occurred before this latest promotion. I think this story illustrates the immense changes in publishing over the last decade, and the opportunities for writers with good books to sell them through smaller, boutique presses. Had I given up in 2010, Swimming with Maya would have disappeared. Mike: I believe that a good book will generate its own momentum if you can get it into the hands of readers and get some word-of-mouth going. My solution is to release the e-book early (simultaneous with or shortly after the print edition), price the e-book aggressively, and then promote the heck out of it. One of the ways I promote it is via websites and e-newsletters that target e-book readers. In a recent promotion that I advertised via BookBub, I sold 3,000 copies of Swimming with Maya in three days. Granted, it was at a promotional price of 99 cents (versus a regular price of $2.99), but the ad more than paid for itself, and there were many other benefits. The book moved way up in the rankings for several days, to the No. 1 memoir in the Kindle store, and to No. 12 out of all e-books in the NOOK store. Based on past promotions, I expect to see higher-than-average sales levels for the next several weeks at the e-book’s regular price of $2.99. I also expect to see more reader reviews, and because of all the paid downloads, Swimming with Maya will now be featured on the pages of other e-books under the “Customers Who Bought This Item Also Bought” heading—which amounts to free advertising. So lots of good things happen when you get the e-book out there. BookBub is selective. You essentially apply to be able to advertise with them. Quality matters. Swimming with Maya has quality blurbs from many reviewers, writers, and subject matter experts, plus about 50 reader reviews on Amazon with an average rating of 4+ stars. Like Richard and Eleanor, I chose a small press for my memoir, Blush—a publisher for the Mennonite Church USA and Canada. Why? I was a rookie without previous book publishing experience in 2007 when I attended the Santa Barbara Writers Conference. I first heard the word “platform” there. I learned that finding an agent and then a publisher can take years and that the odds are stacked against the writer. That was before the tsunami of self-publishing, and also before e-books took off. I might have given up the dream after that conference, but I kept on writing short personal essays and winning literary awards that included publication in the Kalamazoo Gazette. I was a fairly early adopter of social media also. If I hadn’t known Amy Gingerich at Herald Press, I might have looked elsewhere. Amy inspires confidence in everyone she meets and has the kind of smarts you want in an editor. We inked a book deal in August 2011 on the basis of a proposal, not a manuscript (another advantage). There’s another major advantage: I’m a life-long Mennonite, my story centers on the meaning of being Mennonite, I was the president of a Mennonite college for eight years, and most of the people who know me best and care about me most are Mennonite. Every author starts with a core of most likely readers. Mine is Mennonite, literary, and academic. I want to reach far beyond that core, but the best way to do so, I believe, is to excite my first readers. If buzz doesn’t happen there, it’s not likely to happen anywhere. You might be amazed at all the small presses still going strong. Here’s one place to search for them, and here’s another. You can also research them in Writer’s Market. And as with love in real life, we are not searching for a fall back. We want the real thing. Posted in Getting Published, Guest Post, Publishing Industry. Shirley Hershey Showalter’s memoir, Blush: A Mennonite Girl Meets a Glittering World won the Spirituality and Practice Best Memoir of 2013 award. Visit her blog at shirleyshowalter.com/blog. Hi, Kim. Thanks for adding your experience here. I’m hoping others will feel free to do so. And I’m glad to know of other positive relationships. All the best with your launch. I’m off to see that great cover! Fabulous. You capture the advantages really well! Best of luck with your launch! Always great to see you here, Shirley. I enjoyed the way three authors detailed the benefits of a small press. I hope you save a few wonderful manuscripts from being sealed and stored in attics. Thanks, Darrelyn. What a great outcome that would be. You always find a pithy way to say things. I like the matchmaking possibilities. The small press world is fascinating. Such variety! This piece is timely, right on and much-needed. Thanks so much for it. I am seeing gorgeous small presses come across my desk these days. On the best days, the sheer beauty of the product will be rivaled by the wonderfully-written content. It’s a new world, and one to be celebrated, not feared. Yippeee and kudos to you both for this fine piece. Marion, this affirmation means a lot, coming from someone who sees so much of what is happening in the publishing world. I appreciate your comment very much. Thanks, and may a lovely small-pres book fall into your lap again soon. Absolutely! We should all celebrate the vibrancy of small presses. Thanks for your comment. I wonder if the fear of small presses is that because they seem unknown to the general public they can appear as a self-published book. I don’t see that as the case personally, and I think when the time comes, I’ll be just as interested in them, if not more than the big 5. Or however many there are left when I get there. Also, I am not Mennonite, but lived in a Menno residence during university. Some of my best friends are Menno, and I’m glad you’re writing for them! Hi, Heather. Glad to meet you and to know of your interest in Mennonites. And all the best with your own work. My impression is that this group is growing rather than shrinking, though I don’t have any data to point to. As some presses shrink or die, others are springing up. Shirley … as someone below noted, this is a timely post, as I am very reluctant to go the “traditional” route with agent and publisher, but the idea of small press is very appealing. Is there a list of small presses (in addition to the university presses) anywhere? Mary, there are two links in the next-to-last paragraph above in addition to Mike’s suggestion below. Good luck! Very good points, Linda. Authors must be very proactive, whatever route they take to publication. Linda, these are excellent points. Notice that Richard, above, is expecting distribution in Barnes & Noble. That won’t happen for my book. But there are other outlets for it. I’ll be doing events in areas that might have enough customer interest to ask for the book in stores. And some independent bookstores are going to stock. Excellent advice, Jane. Absolutely, always get help with the contract. I had the Author’s Guild review mine on this go round. As you point out, reputable small presses never charge authors and often will offer very favorable royalty splits. Due diligence is the name of the game. I’m sure you know, Susan, that whenever Jane offers her opinion, it’s worth ten of mine. 🙂 Thanks, Jane, for making these excellent points. Thanks, Jane, for noting the difference between small presses and “quality” small presses. Final question: How do small presses make any money? Do they set the price for the book? How much do they charge the authors to purchase the books from them? Who sets the Kindle price? Can the author tinker with that? Susan, University presses set the prices for their books. They give authors a discount price, typically 30 percent off but negotiable up to 40 percent on carton quantities. The author does not have a say in any retail pricing, hard copy or ebook, that I am aware of. Thank you, Richard, for that information. Do you feel that having no control over pricing is a constraint and can affect your sales? I imagine an author can give input, especially at a small press, but pricing is a publisher’s province and I’m glad personally to concede it. Their motive is to sell the book, after all. If someone wants total control, she must self publish. Publishers take what writers do and they package and market and fulfill orders. Beyond control, authors give up a lot of potential income as a result of those services, but in my case I didn’t have or want to take my time for all that. So I am trusting in my press’s professional judgment. Small presses make money when the book sells. They typically set the price for all book formats, though there may be consultation with the author. Unlike the self-publishing field, traditional publishers—big or small—are less likely to be tinkering/experimenting with the price, and they are unlikely to work with the author post-publication to change the price unless for a specific campaign (as described by Mike). This may change, however, since publishers are catching some heat for not being appropriately dynamic about their pricing. Author discount on print copies is negotiable—as Richard says, anywhere from 30% to 50% is typical. Wow, Shirley. What a great article. I’ve been pretty stubborn thus far in mostly thinking about self-publishing. But I’m beginning to swing your way. Thanks for your words and support of those like me who are just starting out. Joan, glad you are a convert. There are many excellent small presses out there. Find one that specializes in your genre and has a solid track record. Good luck! You are most welcome, Joan. I’m certainly not against self-publishing, but I’m glad this option was available to me and would love others to look at all their own options. Keep going! Once your manuscript is finished, you will research the publishing questions as well as you care for the words on the page. It’s not too early to start looking at the lists above for “the one that specializes in your genre and has a solid track record,” as Eleanor says below. Very wise commentary, Kathy. I am so glad you are going to query small presses. Follow the link that Mike posted to the Poets & Writers list. That will be a great help! Thanks, Eleanor. I will check out Mike’s link. Kathy, glad to know you are considering this direction. In addition to the lists in my next-to-last paragraph, and the one Mike O’Mary put up, there is this list of Christian publishers, which might be worth your while, since I know a little about your subject.http://en.wikipedia.org/wiki/Category:Christian_publishing_companies. Others available online. I appreciate the information, Shirley. Thank you. Since memoir is narrative-driven, I’m not sure there’s as big a difference as you think, but here are a few interviews/profiles of novelists and/or small presses. Shirley, what a great article! Great punch line at the end. What a great writer you are! Thank you, Saloma. You could write this article yourself. Maybe you will after your second book comes out. I can’t wait to see it. Thanks, Shirley. I will have a wonderful small press publishing my second book, thanks to you. And I love that Herald Press has the Anabaptist perspective. I could write an article on this subject, but it would not be as well-written as this one. I cannot wait to get your book. I wish you all the best with it! Shirley, highly informative, well thought out and highly readable. I appreciate the links. I’m not yet close to publishing, but do hope to have a first draft completed by year’s end. Keeping my fingers crossed on that. Like the way the three of you presented your individual experiences with small press. And happy birthday! Sherrey, thanks for hopping on board. I learned a lot by interviewing the other authors and looking at the amazing lists of small publishers. I’m glad you found the post helpful. And thanks for birthday greetings. It was a great day. I think you said it well, Jim. Yes, the small press can be an access point for a whole new career. Even if you can’t retire on the income alone, there are many other benefits. Thanks for joining the conversation.